Last December myself, my girlfriend and 12 other friends willfully subjected ourselves to a trial run at the Caribou Mountain Lodge, just five miles north of Schweitzer in the Selkirk Mountains. Mark and Karen Remmetter, the owners, have built a beautiful addition to the horizon on Caribou Ridge. This year they plan to have 16 kilometers of groomed trail for cross-country skiing. Access to the lodge will be groomed for the 6-kilometer ski in up French Creek. Your perch is on a broad ridge at 5,000 feet where opportunities abound for exploring a variety of terrain. This makes it perfect for activities in all seasons, and the Remmetters plan to operate as a four-season lodge. The lodge itself exhibits the type of comfort and amenities like hot showers, a full kitchen, three bedrooms, wind-generated electricity, and a sauna, that make it difficult to want to go anywhere but within its cozy confines. Indeed, the views from any part of the lodge are breathtaking. In this alpine setting the chance for adventure abounds but with the added bonus of indulgence in creature comforts. To tell you the truth, I really didnt know what to expect. Outside, the clouds fell over the ridge like a blanket tossed on a bed. It was snowing hard and the flakes were as big as Walkers donuts. We had just arrived at the Caribou Mountain Lodge and graced the entryway with our vast array of winter gear. I looked out the window into the storm. What would the view be like, the skiing, the sauna, the bed, the host, the future? The heat from the fire sucked me in and I oozed into the living room. It was the eve of the end of the world, Dec. 31, 1999. After a wonderful trip in, we were glad to finally relax. This would be our home for the next three days, and if the world shut down we just might have to stay longer. Outside it was clearing up and through the window I saw a beautiful view of Lake Pend Oreille and the Cabinets. Out the window to the north a sweeping panorama of the Selkirk Crest and the Seven Sisters wooed me, taking me on imaginary descents down powdery mountainsides. For feeling the essence of North Idaho, this lodge hits you with a lasting first impression. Mark Remmetter, the owner of the lodge and our host, strolled in through the front door and exclaimed, as he brushed snow from his shoulder, three more inches. The snow hit the stove popping and hissing. Should be good on Caribou tomorrow, he said. We ooohed and aaahed and sank a little deeper into the soft couches. I like this guy already, I thought. The ornate wood cook stove was crackling and thick smells were wafting from the kitchen. Mark and Karen have styled out the kitchen with everything you need to create the best meals this side of timberline. We had pre-organized our food into meals, and everyone brought something to contribute each night. I sauntered along the ample counter space covered in Italian delectables like lasagna, gorgonzola bread, tortellini and fresh salad. The banquet-sized table was adorned with bottles of wine, candles and settings for 15 of us, which it gracefully accommodated. In the warm glow of light we toasted to closing the century amongst friends in a unique and beautiful place. As we feasted on the copious amount of food, we were oblivious to the storm once again raging outside. The lodge is meticulously crafted out of the native timbers Mark found on the ridgetop. The large beams that span the ceiling and stairway treads that sweep up to the second floor, the trim around the windows, the floors, even the railings and pegs to hang coats on are a mix of lodgepole, larch, hemlock, fir and spruce, all milled on site. All the woodwork complements the warm, rustic feel of the lodge, but right now I appreciate the fact that this lodge is solid. A step out on to the west porch for some fresh air helped bring me out of my food stupor, but I didnt stay out long for the wind was howling. Mark was playing guitar and singing Fire on the Mountain. I ad-libbed my own words into the song and came up with, Lodge on the mountain, snow flakes in the air, powder in them hills, and its waitin for me there. Rose couldnt contain herself anymore and transformed the living room into a disco. I didnt think it could happen, but all 15 of us were dancing to Jungle Boogie. Mark, adorned in a flowery Hawaiian shirt, was unfazed, and we all started to get serious about celebrating New Years. I thought of what other people might be doing at this moment. We could be at home with the family reminiscing about old times. Nahhh. Maybe we should be in an underground bunker somewhere crammed in with a years supply of Spam and water. Definitely not. We had it made as far as I was concerned. Celebrating with great friends, secluded from the rest of the crazy world, and if it all came down tomorrow at least we would get one last day of excellent skiing. When the clock struck midnight, although we didnt know for sure, we all huddled out on the porch and yelled and screamed and spun noisemakers and tooted on paper horns until we were freezing, in spite of the howling wind and snow, in spite of Y2K fears. I awoke feeling a little groggy the next morning, but I could hear the bustle of activity already downstairs. I was impressed to see Mark out the window buzzing around on his snowmobile taking care of the morning chores, checking the windmill, stocking the sauna with firewood. Coffee was brewing, the stove was open and crackling with kindling, and in the corner the radio was on. It took a while to register, as do all things with me in the morning, but I realized that it must mean the world didnt come to an end. Not like it would matter up here. In a weird sort of way I was disappointed. I viewed the whole thing as a chance for humanity to get a grip on what is really important, on what really sustains us, like resourcefulness, friendship  and powder. This world needs more powder, and the new millennium was proving to be a good one with five more inches. Stuffed with pancakes, sausage, bacon and some fruit, we dismantled our gear hanging on the pegs near the front door and walked out into the soft silence of a powder day. Mark gave us some recommendations on where the snow would likely be the best, where to stay out of the wind, and where to find the best lines. The clouds had lifted but hung just below the summit of the highest peaks. The world fell away to Caribou Creek to the north, steeply into Berry Creek to the south, the gaping Purcell Trench to the east and gently to the west, to Caribou Peak. The west trending ridge would be our route to the summit, and possibly beyond. Higher up, the view of the Selkirk Crest was enticing, and to the south the craggy world that lies north of Schweitzer beguiled us with opportunity. On a good day you can ski to the lodge from the resort amongst the crags and cornices, and some of the more adventurous souls might drop into many of the lines tucked into the hidden bowls. In a couple of hours we reached the summit of Caribou Peak. The old fire lookout stood defiant to years of abuse from the strong winds and crushing snow and ice. We didnt have long to stay; the wind was picking up and the clouds were descending again. We remembered Marks advice and hastily dropped into the trees to the north of the summit. After dodging a few gnarly old trees, we broke into an open powder field with a slope that put me into an entrancing rhythm. The open slope graded into some evenly spaced spruce trees, and my turns seemed to sync perfectly between them. In the shelter of the trees, the pitch steepened and the powder deepened. I could hear Bill to my right whooping with delight, and Chuck to my left was a silent streak through knee-deep snow. Mark was right, of course. He had led us to the perfect stash. He is, after 20 years of exploring this area, quite a scholar of the local backcountry. Back at the lodge the sauna was piping hot, and once again I was basking in just one of the many pleasures of this Selkirk Shangri-la. We were all having the time of our lives, and the New Year had just begun. Not a bad way to start, we all agreed. Tomorrow we would return to reality. Would things be different than when we left it in the previous millennium? We werent quite sure. We were certain of one thing, however. We would definitely be returning for New Years Eve, 2001. For a unique backcountry experience, in any season, call Mark and Karen Remmetter at (208) 255-2333. 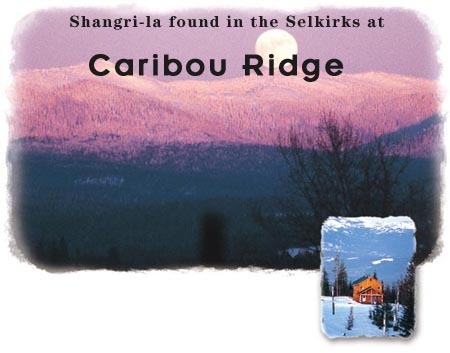 More information can be found on their website at www.cariboumountainlodge.com. in his off time, gets to have entirely too much fun.